Meanwhile, many banks have helped confuse and misdirect the investment community out of gold (GLD) and silver (SLV). This was a classic shakeout and bear trap which may start a major short covering rally. Be ready to see increased short covering combined with record physical demand. These are the two elements to spark a price spike and breakout higher in both gold and silver. These markets are ready to start moving higher after basing for 2 years and having a major short attack by the big banks too big to fail and the media. Right when gold and silver were about to gain some momentum after bouncing off key support for most of 2012, simultaneously Goldman Sachs came out with a bearish prognostication on precious metals, old Fed minutes are brought up and Cyprus says they will sell gold. This resulted in a shakeout below $1535 and a massive bear trap for momentum traders who may have been stopped out. The markets will do whatever it must to confuse, misdirect and obfuscate the long term trend investor. In my opinion, gold and silver are still below 1980 inflation adjusted highs and miners (GDX) are trading at record low valuations. Precious metals bubble talk is gibberish. One should not even discuss irrational exuberance when the miners are in the midst of a hysterical fear which has dropped junior mining valuations (GDXJ) to all-time lows. Until we witness new price paradigms when the consensus understands the wealth in the earth approach we should not even discuss bubbles. The real bubble is in U.S. debt which has risen more than 17 times 1980 highs, but still many refuse to recognize the real bubble and the possible ramifications of the bond bubble bursting. Bonds have been in a thirty year uptrend and are being manipulated ridiculously higher as investors seek liquidity and yield. Incidentally, these shakeouts can lead to breakouts as a major rotation occurs near the bottom and long term value investors acquire at a discount. Notice the increase in physical demand and thin inventories for gold and silver worldwide. Market makers or shorts in precious metals and mining stocks are squashing every breakout and in fact using technical analysis as a contrary signal to shakeout momentum traders over the past two years. I have learned that these players use the charts to go against the market. When technical signals fail repeatedly in precious metals and fundamentals are ignored by the market many investors leave the arena and fold. This may be a ploy from policy makers to foster an environment with cheap commodity and precious metal prices to make it appear inflation is subdued. This would support more easy money policies to pay down soaring debts and try to boost a struggling economy. A few weeks ago, it was discovered that the Fed sent out the minutes early to a small group of recipients which may have included Citigroup, JP Morgan, Goldman Sachs and Barclay's. Investors began to panic that the Fed would exit Quantitative Easing. Then I observe major banks coming out with bearish analysis saying troubled Central Banks would sell gold. Could there have been trading based on this information? Does this occur more often giving some Washington insiders an unfair advantage in the marketplace? I know many of our elected officials in Washington investigating these banks are shareholders or former employees. Its the old case of the fox running the hen house and questions the credibility of our elected officials and representatives. Too big to fail seems like modern day cronyism reminiscent of the Tammany Hall days. Investors are realizing that the major U.S. banks may be losing their credibility and their hold on fiat currency. They are hitting new highs based on government support through record low interest rates, cutting costs and creative accounting. We are not seeing increase of earnings or revenues from organic growth. Unemployment remains high and inflation may be greater than many yet realize. Look at the move in natural gas over the past year of over 120% and lumber. Inflation is still present. Eventually, more investors will look into alternatives currency hedges in gold and silver bullion, where we have witnessed demand rising exponentially after this pullback. When I see these Wall St. firms bearish on the yellow metal, I know the goal is to make short term profits on their record short positions before they cover. I believe the gold bull market will recover from this short attack and continue with a breakout into new highs past $1900 sooner rather than later. This may be an accelerated move sooner rather than later after many of the weak hands have been shaken out. When gold and silver breakout, watch the small junior miners priced at Armageddon 2008 prices soar. 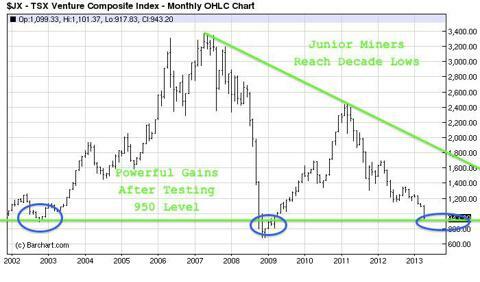 Some of these discounted junior mining stocks could see exceptional gains from these low decade low levels. Not only is Goldman negative on gold and silver prices but they advised clients to go short, only to cover a few days later. This is a risky tactic in a market with a powerful longterm 12 year uptrend and goes against all textbook rules. What is their reason? The mess in Cyprus didn't trigger a run into precious metals and that gold is not seen as a safe haven. Also they were concerned that the Fed will exit QE and that troubled Central Banks will sell gold. To me this is short sighted analysis with the goal to stimulate panic and uncertainty on the precious metals. The fact remains that not one of these Central Banks sold any gold and $85 billion worth of QE is being funneled into the banks and housing sector every month. I believe this bear attack may indicate that Goldman and other banks may continue to cover their shorts as the weak hands sell their precious metal positions at a potential bottom. Gold and silver may be staying down because hedge funds have a record short on them. Goldman Sachs may be allowing these funds to cover before an eventual short squeeze which could help catapult gold and silver into new highs. Central Banks may also be using this negativity in the precious metals market to load up before a possible breakout move. Bloomberg reports, "Gold Prices Tumble Most in Five Months as Cyprus to Sell Bullion". Investors may be momentarily questioning gold and silver as a shelter from turbulent financial weather in the short term. Now the sectors supported by Quantitative Easing are soaring while precious metals are hitting major support levels. The manipulated dollar (UUP), large caps equities (SPY) and bonds (TLT) appear to look strong, while the commodities look weak. This may be part of the tools of Cental Bank policies. To paraphrase Freddie Mercury, "Is this real life or is this just fantasy? An escape from reality?" Mark my words eventually the investment community will see the intrinsic value in precious metals in a world of declining fiat currencies and soaring sovereign debts. 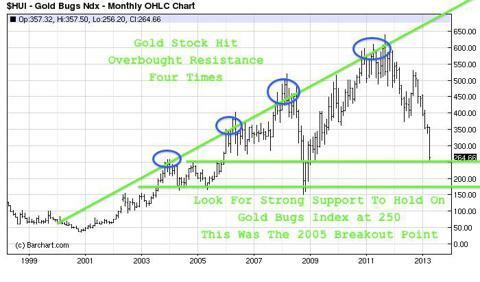 We may be hitting multi-year lows in precious metals and the miners. The U.S. dollar and large cap equities may be seen as the safe place temporarily by the masses, but they are in fact possibly the riskiest assets at the moment. The equity markets are very overbought, hitting a 15 year high. Bargains present themselves in the precious metals arena, which has been a store of value for 5000 years unlike Bitcoins, ETF's, Dollars or Bonds. It is hard to teach an old dog, new tricks. The majority of investors remain ignorant about potential inflationary hurricanes which could hit sooner rather than later. They would rather stick their hand in the sand and believe good times are here again. Will I be selling my gold, silver or the miners or be going short because Goldman says so? No. Gold is not just a safe haven from financial turmoil. Precious metals are an alternative to fiat currencies which are losing purchasing power. Negative real rates exist all over the world and right here where I live in the United States. Remember cash has no intrinsic value and can be printed to infinity. There is only so much gold and silver in the ground and in the earth. Precious metals have real values and is the obverse of printing unlimited paper money and soaring debts. Do not be surprised to see silver and gold being increasingly used as a means of exchange. Despite the manipulated financial markets and distorted media designed to confuse simple investors, 13 states are about to recognize gold and silver coins as legal tender. Why are the states making this move? Historically, a country or empire that used the printing press to pay down soaring debts eventually resulted in hyper-inflation and the destruction of the fiat currency. The U.S. is undergoing quantitative easing and debts are continuing to soar. Interest payments on that debt are currently low due to the manipulated bond market, but that could change if investors stop buying U.S. debt. The lawmakers from these states believe that gold and silver will over the long term keep its value. Texas is one state that has been proactive with its sound money approach. The Texas Retirement System owns gold and miners including one of our GST recommendations as a hedge against a dollar collapse. I believe this trend of viewing gold and silver as real money will continue. Investors in an environment of negative real rates will continue to seek out instruments which retains their value. Whatever you do, don't let the spinmeisters panic you out of your gold. Look at these pullbacks as opportunities. Buy silver (AGQ) and gold (UGL) when it is oversold and when the pundits are negative. Don't panic about Cyprus who may be forced to sell their gold to fund the bailout. Many other countries such as China, Russia and India would be glad to buy it. There was a time in the late 90's and mid 70′s when Central Banks sold gold and the price dropped significantly. This turned out to be a buying opportunity. Nothing goes straight up or straight down, sometimes price moves sideways or backwards. Patience and fortitude is critical during these down and flat markets. Be careful of Goldman Sachs' forecast who tend to raise targets during tops and are negative when it may be bottoming time. They expected a major breakdown in gold at a time when the S&P500 and Nikkei (EWJ) soars to record highs due to currency manipulations. Now they are covering their shorts as gold holds $1400. Investors supposedly are selling their gold due to Fed Minutes being released that states some officials want to end quantitative easing by the end of 2013. This is old news and is based on statements which did not take into account the recent poor jobs data. The S&P500 has doubled, yet the economy is still weak according to Bernanke. Bernanke is the one whose opinion matters most and he will continue to devalue to boost the economy through record low interest rates and quantitative easing. Similarly, Japanese Prime Minister Abe has pledged to reverse deflation and the European Central Bank continues to boost liquidity. All these moves will eventually cause a breakout in precious metals and the mining equities which have almost pulled back to 2008 levels, despite gold and silver being close to double 2008 values.